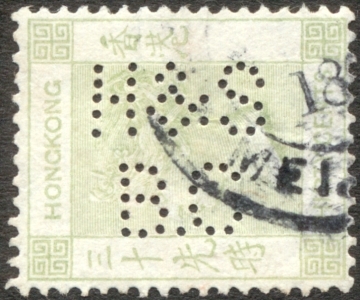 H&S/B.C with Japanese Paquetbot cancel. Hong Kong companies stamped their company names on their stamps to stop theft. Webb suggests perfins were allowed from 1890, however they were used before this date. Webb has listed 34 Companies that issued Perfins. This list has increased since that publication. The HK Study Circle lists 66 different Companies that used perfins. I have the front and back perfin image of each company listed below. Still a few to go. Information on Perfins can be found from the following references. 2. "Hong Kong Security Markings List" by Philippe Orsetti and Peter Pugh, listed in the Hong Kong Study Circle Journals. I wish to thank all of the above for their assistance in providing some of the information used in the following pages. Dear Viewer. Some of the pages below have a lot of photos. If you have a slow modem it will time out and you will get a square with a red cross in the corner. To open this image click the photo with the right button of your mouse, from the selection panel click the show picture option with the left button. Enjoy. Rod Sell. The numbers underlined are those used by the Hong Kong Study Circle. For more detail look in the links listed below. 2c A P C /H K - Asiatic Petroleum Company Amoy cancel. 5 B & Co. - Bradley & Co.
6 B & Co. / Amoy - Boyd & Co. Amoy, Hong Kong cancel. 6a B & Co. / Amoy - Boyd & Co. Amoy, Amoy cancel. 10 B M / & Co. - Behn Meyer & Co.
10a B. M /& Co. - Behn Meyer & Co.
13 B W & Co. - Burroughs Welcome & Co.
16 C &/ Co. - Carlowitz & Co.
17A C . J / T / E . C - China & Japan, Telephone and Electric Co.? 20 D.A.T. / Co.Ld. - A variety of B.A.T./ Co.Ld. with damaged pins. 20A D L / & Co - Company yet not known, could be Douglas Lapraik & Co.
22 D. & / Co Ld - Dodwell & Co.
23 D & Co / Ltd - Dodwell & Co.
24 D.C / & Co. - Dodwell, Carlill & Co.
25 E.S. & Co. - Eduard Schellhass & Co.
25a E.S. & Co. - Eduard Schellhass & Co. Shanghai cancel. 26 F.B.& Co. - F Blackhead & Co.
30 H & H - Hall & Holtz Co-Operative Company,Ltd. Shanghai. 31 HS - H. Skott & Co.
32 H.K.E. - No image available yet. This is a big field with lots more to be discovered. of the H broke resulting in an N.
Different style B to 33i. 34c H. W &. Co (2 dots after &) - Holliday Wise & Company Shanghai. 36A K. - Hong Kong Government. 38 K&H/ C - No image available yet. 39 K & W - Kelly & Walsh. 39a K & W - Kelly & Walsh. Hong Kong cancel. 41 L & Co. - W.R. Loxley & Co.
42 LS - L Soyka No Images available yet. 43b M C - Melchers, Hong Kong cancel. 43c M C - Melchers, Shanghai cancel. 47 N A / S C - Nestle Anglo-Swiss Condensed Milk Co.
49 O.C.B.C. - Oversea-Chinese Banking Corporation, Limited. 50 P & Co. - Could be R & Co. with pins missing? 51 P & O / B.C - Peninsular & Orient Banking Corp.
54 S & Co. - Siemssen & Co.
55 S.B/& Co. - Believed to be Smith Bell & Co.
55A S.C.S.B. - The Shanghai Commercial & Savings Bank, Ltd.
55B S D / & / E Co. 6mm letters, 60 holes, Shanghai. 57 S K - No image available yet. 58 S.W. & Co. - Sander Wieler & Co.
58A T - Hong Kong Government New Territories. 60 T/EC - Partial of III-17A C J / T / E C.
60A U I / S C - Union Insurance Society of Canton. No image yet. 61 U T / Co - Union Trading Co.
64 W. & Co - W. A. Hannibal & Co.
65 W - Company not yet identified. 65A W/KF - Company not yet identified. 67 6 pointed star 12 holes. Design made of 4 rows of 4 hole each 6mm in length.